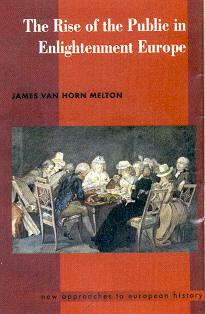 James Melton's accessible study examines the rise of "the public" in eighteenth-century Europe. Focusing on England, France, and the German-speaking territories, this is the first critical reassessment of what the philosopher Juergen Habermas called the "bourgeois public sphere" of the eighteenth century. Topics include the growing importance of public opinion in political life, transformations of the literary public realm, eighteenth-century authorship, theater publics, and new practices of sociability as they developed in salons, coffeehouses, taverns and Masonic lodges.